Tucked away on the border of Shropshire and Cheshire lies the Combermere Abbey Estate, a glorious retreat from the hubbub of everyday life. It enjoys a spectacular setting among hundreds of acres of beautiful countryside, and an equally rich history dating back almost 1,000 years. Combermere Abbey boasts a stunning walled garden and historical buildings all whilst sitting close to a breathtaking lake. Function rooms include the stunning Glasshouse and The Pavilion, both are perfect settings for celebrations and corporate events. In addition, there are ten fabulous 5-star guest lodges, making Combermere Abbey the perfect get-away for business or pleasure. One of the secrets behind the charm of Combermere is the history of the family that currently live there and have devoted many years to the restoration of the Abbey, estate and grounds. This bond between family and building makes it simply unique, and demonstrates the personal touch behind such a grand location. While enjoying a growing reputation as a sought after venue, this charming place has retained a unique atmosphere which makes it such a special place to visit, if even for a stroll around the extensive gardens. Our task was to modernise Combermere Abbey’s web presence to reflect the different areas of the business, while showing off the estate itself as one of the North West’s leading wedding venues. Our aim was to help increase bookings both for potential weddings and for short holiday breaks. What better way to do so than by igniting the imaginations of potential visitors, with an enhanced user journey around the website with ample, yet carefully selected, photography. 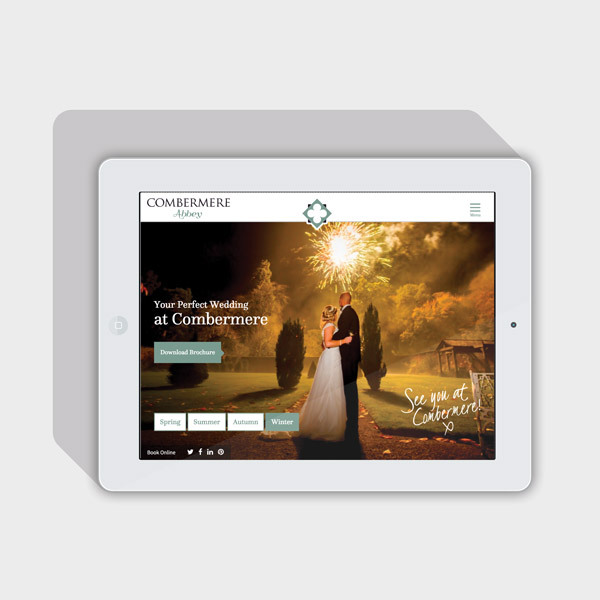 Combermere already had an incredibly well recognised brand, used throughout the website and offline material. With a project to update and improve the website, Ultimate’s challenge was to ensure that the logo sat comfortably within a new layout, remained true to its history yet provided a modern and universally identifiable symbol. Combermere isn’t just the ideal wedding venue. The flexibility of the estate makes it the perfect destination for a short break or even your work’s Christmas party. This means the website needs to elegantly take the user to the most relevant pages, while not displaying an overwhelming number of options. 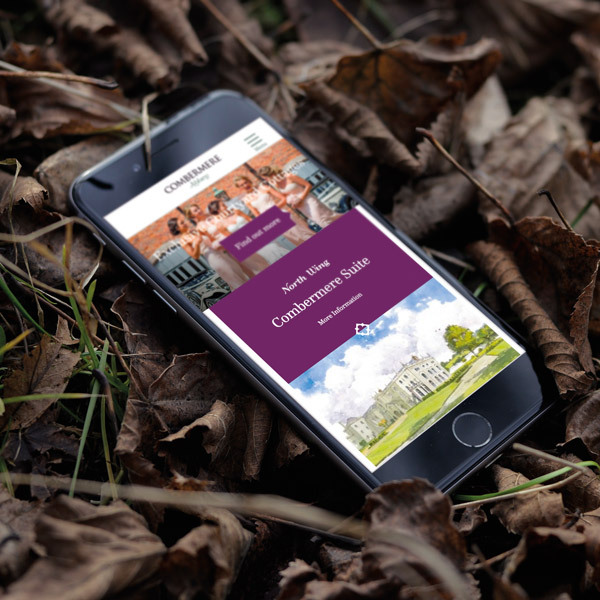 With the growing trend of multi-device browsing, the new Combermere website allows the pages to be viewed beautifully on any device, along with clear methods to make an enquiry or book a room. The project started by refreshing the Combermere brand and building a sub-brand message, ‘See you at Combermere’. The purpose of this is to place visitors at the heart of Combermere Abbey, helping people to picture themselves at the venue itself, with a message that they might use themselves before their very own event there. Our team also devised a simplified navigation structure for the website, helping to highlight the different areas of the business. This is supported by carefully selected photography and information about the Abbey and gardens, highlighting the rich history and ongoing restoration. The clever use of photographical navigation to complement the primary and secondary navigation for deeper internal pages, allows both flexibility for the client while always displaying the best content for the end user. However, this is far from a flat, linear information structure. Rather, it’s designed to take visitors on an emotive journey, to feel an affinity with Combermere Abbey as the perfect venue for their mini-break, business event or wedding celebration. ‘When we decided to refresh our website, our key objectives were to make it mobile friendly, truly reflect our business offer and introduce powerful photographic images to tell our story. We were immediately impressed by the time and effort that Ultimate had invested in their initial very visual presentation. It set them apart from their competitors and permitted a very important and constructive conversation to happen which established an immediate rapport between us. With a touch of modernity the new website takes the user to the best pages that they need. Intuitive calls to action and data capture allows Combermere to attract and communicate to their target market quickly, effectively and in an updatable manner.